Token provides a global open banking API that connects easily with a bank’s existing infrastructure. Whether you are a business needing to initiate payments, or you are a payment service provider wanting to collect account data, the SDK provides the tools you need to get started with Token’s sandbox. At the core of TokenOS is the smart token. 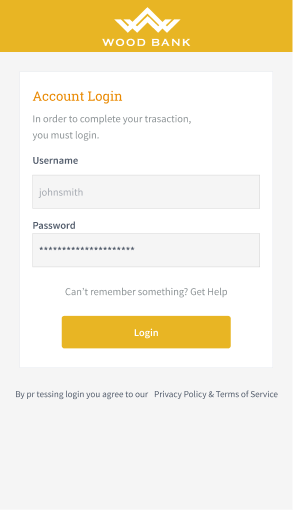 It is the authorization to access assets such as a user’s balance or transactions, or to initiate a payment on behalf the user. It has a unique ID and is programmable by defining conditions that manage access to the token’s assets. 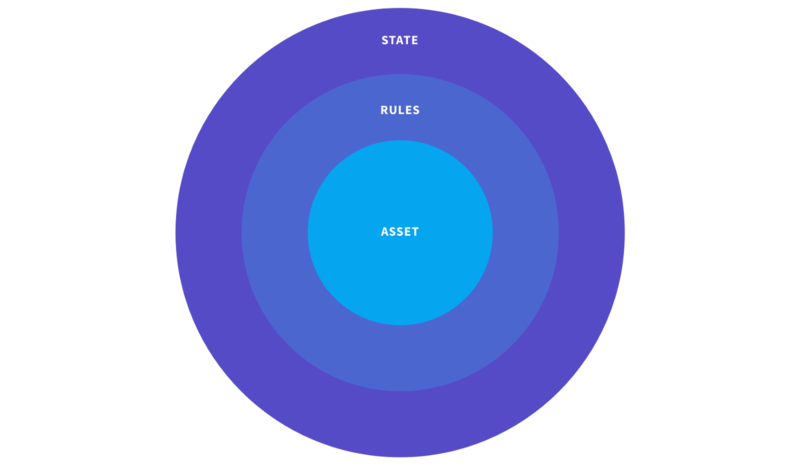 Both the conditions of the token and its assets are immutable, meaning neither can be changed after it is created. Every business, company, or third party provider that interacts with Token is referred to as a business member. Business members communicate through the Token cloud using the Token API. The Token cloud acts as a router, generating smart tokens and verifying their conditions and digital signatures. Any Token member can use the API, and can do so using one of the language-specific Token SDKs. The Token cloud is distributed, with services hosted on geographically dispersed servers operated by Token and its partners. The Token cloud is integrated with banks and other financial institutions through a thin integration layer that allows access to a bank’s core banking services. TokenOS uses PKI (public key infrastructure) to secure communications between the Token cloud and its clients. Public keys are stored in the Token cloud and are publicly shared, requiring valid signatures to be changed. Private keys are never shared. Each Token API invocation is digitally signed by the caller using its private key(s), and the Token cloud and banks verify the API request by using the caller’s public key. The Token SDK greatly simplifies the development process by wrapping the complex PKI in a set of simple interfaces. Before anything else, you must set up the Token client object (TokenClient). The client interacts with the Token network, with its configuration controlling the connection. It sends and receives calls and specifies which Token environment to use when testing. The client also functions as an abstraction on top of the network connection reconnecting as needed and killing idle connections. Typically, one SDK client instance is used for all operations. Before you make calls you will need the latest Token SDK in your preferred language. The sandbox is a stable testing environment which uses fake banks and fake money. When your code is ready for production, you can contact Token to discuss the next steps for switching to our production environment. The SDK shows how to set up an Token client that saves your user’s private keys in a directory named keys. If your code runs somewhere with a safer storage space, you can implement a KeyStore that stores keys elsewhere, using UnsecuredFileSystemKeyStore as a guide. The SDK shows how to set up an Token client that saves your user’s private keys in a directory named keys. If your code runs somewhere with a safer storage space, you can write a crypto engine that stores keys elsewhere, using UnsecuredFileCryptoEngine as a guide. The SDK shows how to set up an Token client that saves your user’s private keys in a directory named keys. If your code runs somewhere with a safer storage space, you can implement a IKeyStore that stores keys elsewhere, using UnsecuredFileSystemKeyStore as a guide. Go here for information about Local Key Storage. Before connecting to banks through TokenClient, you must first create a Token business member using the createMember method. NOTE: If you have already created a member, load your existing member. Otherwise, you will need to set up an alias along with your member. const domain = Math.random().toString(36).substring(2, 10) + ".com"
Members have human-readable and verifiable aliases. As a Token business member, you must provide your business web domain as your alias. An alias can only be claimed once. After that, it is no longer available to other members. An alias belongs to only one (1) member, and must be verified before it can be used. The Member method addAlias attempts to add an alias for a member. It will fail if the alias is already in use, so you will need to choose another. The Member method removeAlias removes an alias from a member. If you already have successfully-verified aliases, call the Member aliases method to retrieve them. Add your domain name using the Member addAlias method. Send Token a message that includes your business member ID. If you do not know your ID, you can retrieve it using the Member memberId method. Fetch a list of the member’s aliases by calling the Member aliases method. Fetch the first alias used by the member by calling the Member firstAlias convenience method. To resolve a member’s identity, you can look up a member’s ID using their alias and/or profile. If you want to find out if an alias already belongs to a member, call the resolveAlias method. This can be helpful in discovering if there is a typo. // If this call fails then the alias does not correspond to an existing member. // will have the correct type, e.g. EMAIL. // The resolved alias with the correct type, e.g. EMAIL. To obtain a Member object for an already-existing member, you must have a TokenClient, the member ID of an existing member, AND the member’s keys. Add the keys to your SDK’s keystore and then call TokenClient.getMember on the member ID. Most of the newly created member data is stored in the Token cloud, such as public keys. Private keys remain in local storage. Each business member has a profile that allows users to find the member they are searching for without the alias or ID. This display name must be your business name. This identifies you in push notifications sent to your users’ apps, avoiding confusion and unintentional purchase cancellations. E.g. 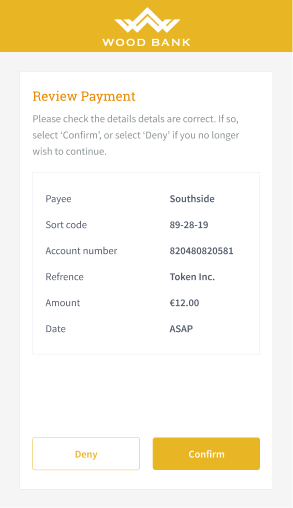 “Southside is requesting €10” as opposed to “Unknown merchant is requesting €10”. To get member profile information, call Member getProfile. This gets a Profile data structure containing the member’s display name. Call Member setProfile method to set your display name. This method takes a Profile data structure. Each member has cryptographic keys used to endorse or sign a token. Each pair has a private and a public key. The three public keys are uploaded to the Token cloud; the private keys are put into secure local storage. The private keys will be used to sign all requests made through the Member object, such as initiating requests for account access or payments, or changing the Member’s profile. Token will verify each request using the public keys. Requests made directly from the TokenClient, such as resolving an alias or retrieving a list of connected banks, are not signed and are therefore accessible by anyone. The following methods control keys in the Token Cloud ONLY. To add more keys: call the Member approveKey or Member approveKeys method. To remove previously-uploaded keys, call Member removeKey or Member removeKeys. IMPORTANT: Removed keys are no longer valid and cannot be used to sign requests. To configure where the client stores member’s private keys, choose a CryptoEngine type and pass it as a parameter to Token.createMember, Token.provisionDevice, and Token.provisionDeviceLow. Token.MemoryCryptoEngine keeps keys in memory and forgets them on restart, which is useful for unit tests, but not for persistent members. Token.UnsecuredFileCryptoEngine keeps keys in files in a directory. You must specify which directory as a parameter when creating the Token SDK client. Token.BrowserCryptoEngine keeps keys in browser’s localStorage, which is useful for web clients. You can define another CryptoEngine key storage type if you don’t want to use the one above. One option for implementation is the BrowserCryptoEngine implementation - a thin wrapper around BrowserKeyStore and stores keys. Use the KeyStoreCryptoEngine helper class to ease defining a similar, thin, wrapper. For more information about implementing a custom CryptoEngine, see the SDK’s README. To configure where the client stores member’s private keys, choose the KeyStore implementation and pass it as a parameter to TokenClient.builder().withKeyStore(). InMemoryKeyStore keeps keys in memory, but forgets on restart. This is useful for unit tests, but not for persistent members. UnsecuredFileSystemKeyStore keeps keys in files in a directory. You must specify which directory as a constructor parameter. You can define another KeyStore class if you don’t want to use the one above. To configure where the client stores member’s private keys, choose the IKeyStore implementation and pass it as a parameter to TokenClient.Builder.WithKeyStore(). InMemoryKeyStore keeps keys in memory, and forgets on restart. This is useful for unit tests, but not for persistent members. You can define another IKeyStore class if you don’t want to use the one above. For businesses, the most fundamental part of Token is creating a TokenRequest. This is how you will request payments and data. As mentioned in the Overview, smart tokens are at the core of TokenOS. Transfer tokens authorize payments, or the transfer of assets or funds from the payer to the payee, and function as programmable money. Access tokens authorize the access of member data. The type of access depends on the conditions of the access token, and can include “who,” “what,” and “how” that data can be accessed. A member (the grantor) authorizes a service (the grantee) to access and aggregate their account information. Tokens are created by the Token app. To begin this process you must create a TokenRequest which will be sent to the app. The created token will mostly consist of details specified on the TokenRequest. callbackState Developer-specified string that allows state to be persisted between the the request and callback phases of the flow. A RequestId will be returned on submitting the TokenRequest. This ID references the stored TokenRequest and is used to verify that the conditions of the request are unchanged. It must be included in the URL when redirecting the user to Token to obtain authorization. NOTE:The member creating the TokenRequest must match the member that redeems the token later in the flow. Additionally, a TokenRequest expires within 60 minutes. If you do not receive a response within this time, you will have to create another request. To make a request for a transfer token, use the static TokenRequest.transferTokenRequestBuilder(amount, currency) method, where amount is the total lifetime amount of the token, and currency is the 3 letter (ISO4217) currency code (e.g. “EUR”). Though optional, Token recommends setting a reference ID (not to be confused with the requestId) in the tokenBuilder, which is included in the request to transfer the funds. This allows businesses the ability to easily reconcile transactions against payments they receive. IMPORTANT: Due to restrictions of particular payment rails, this value cannot exceed 18 characters in length. ACCOUNTS - Request access to basic information about a user’s account (you can call getAccount() on this account). BALANCES - Request access to a user’s account balances. TRANSACTIONS - Request access to the transaction history of a user’s account. TRANSFER_DESTINATIONS - Request access to the payment rails which can be used to transfer money to a user’s account. e.g. the BIC and account number for a SWIFT account. FUNDS_CONFIRMATIONS - Request permission to check whether a user’s account has sufficient permission to make a given payment. After creating a TokenRequest, construct a URL that directs to the Token web app. Send an HTTP POST to your back-end to initiate the token request creation in Step 1, and redirect using an HTTP 302. Another option is to create a Token Button that either redirects to, or creates a pop-up of, the Token web app in the user’s browser. For more information, please see the sample code below. After the user is redirected to the request URL, they will be prompted to agree to the Token terms and conditions. After accepting, they will be taken to their bank where they will authenticate themselves and authorize the payment or data access transaction. Once the token has been created, TokenOS will redirect to the callback URL specified in the TokenRequest with an HTTP 302. TokenOS will include the necessary parameters for your server-side code to redeem the token in the callback URL. NOTE: If you are integrating with a mobile app, you can initiate the token request creation in a WebView in Create a Token Request so the redirect is also in the form of an HTTP 302. When your server-side code receives an HTTP GET request at the callback URL, it should use the Token SDK parseTokenRequestCallbackParams method to extract the tokenId, and verify the signature and CSRF token. Tokens must be redeemed to create a payment or access account information. Use the server-side redeemToken method to create a Transfer. This initiates a payment (via one of Token’s supported rails: e.g. 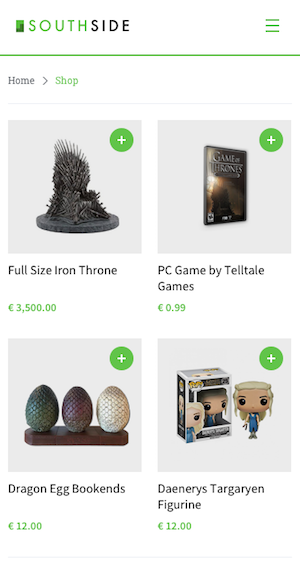 SEPA) from the user’s bank. // Payee redeems a transfer token. // Money is transferred to a payee bank account. The transfer object (or its ID) returned can be used to retrieve the status of the transaction. Use the server-side call forAccessToken to get a Representable object that represents the user. You can then call getBalance, getTransactions, on the Representable object to retrieve account information. These methods will only succeed if the specified access token has sufficient permissions. The forAccessToken method allows you to specify which access token to use to access information. You should keep track of the association between your access tokens and your users. Since the Token Request Flow is based on OAuth 2.0, it is strongly recommended that you implement protection against CSRF and “OAuth Cut and Paste” (slides). TokenOS helps you mitigate both threats by providing a way to cryptographically bind CSRF tokens to the token ID. This modifies the above outlined flow by introducing a step before the beginning of the process. 0. Authenticate the Browser - Front-end authenticates with back-end service and creates a session. 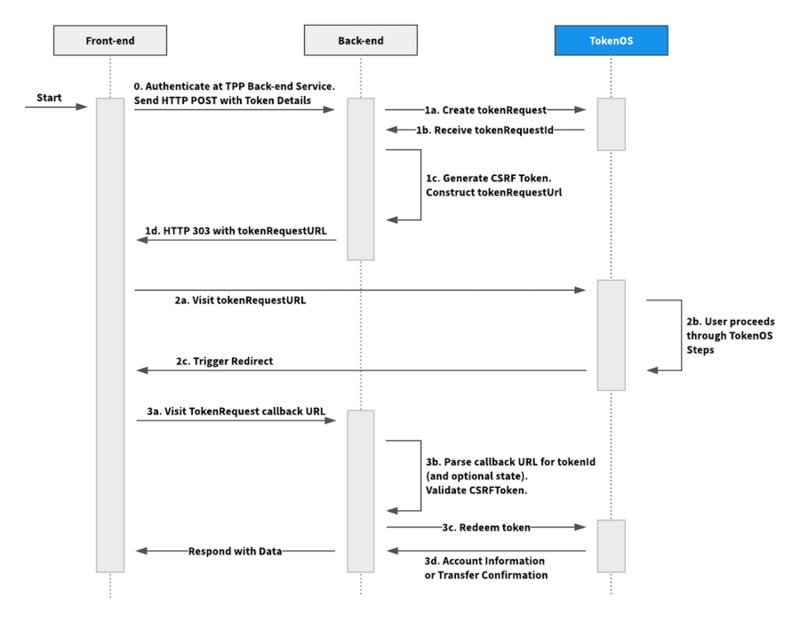 - Back-end service responds with HTTP 302 requesting redirect to tokenRequestUrl. 2. Redirect to TokenOS to obtain authorization - Front-end visits tokenRequestUrl. - User proceeds through TokenOS steps. 3. Redeem the Token - Back-end service parses the callback URL, validates csrfToken, and obtains the tokenId and optional state. - Back-end service uses tokenId to redeem to access account information or create a payment. The Smart Token Request Flow is a web-based flow. In order to mitigate the above attacks, the first step is to authenticate your user in a web-based environment. In a typical application the user is already logged in, so this may mean something different depending on if you are working with a website or a mobile application. A web application does not need to implement anything additional if the user is already authenticated. A mobile application will need to authenticate the user in the WebView. In order to avoid authenticating user on a separate web page you may want to share sessions between the mobile application and the WebView, or use the existing mobile app session to create a new session in the WebView. There are two methods in the Token SDK to help with improving your application security. Generates a token request URL that can be used to initiate the token request process. Parses a Token Request callback URL, validates the cryptographic signature binding the csrfToken, state, and tokenId, and returns the tokenId and state. csrfToken Unique string bound to the session of the user (e.g. the hash of a session cookie or associated with server-side user session). The csrfToken set in the TokenRequest builder and passed in parseTokenRequestCallbackUrl to validate that the same user session initiated and completed the request. TokenOS suggests that you follow the IETF-recommended mitigation method of binding the CSRF token to the user’s authenticated state (using, for example, a the hash of a session cookie). Note: Sensitive strings (such as sessionCookie) can be used directly as the csrfToken in the Token SDK since it hashes the token before using it. For more details on CSRF attacks against OAuth 2.0 and mitigation techniques, refer to this rfc. If your application does not have user authentication, you can use Util.generateNonce to generate a secure random string to use as a CSRF token. state Developer-specified string that allows state to be persisted between the the request and callback phases of the flow. IMPORTANT NOTE: The state parameter can contain additional application-specific information, but should not be used to authenticate a user. The authentication must be performed prior to the initiation of the Token Request Flow, and the callback should use the same authenticated session. Construct the token request URL using either the generateTokenRequestUrl or generateTokenRequestParams method from Step 2.
requestId ID of the TokenRequest to be used for this request. Retrieve the state when parsing the callback url in Step 3 by passing in the same csrfToken that was set in the TokenRequest in Step 1.
tokenId ID of requested token. Can be redeemed for information or payment initiation. Clone or download the appropriate sample. Each sample contains a reference back-end service implementation and a reference front-end website. Instructions are in the readme file. Token provides optional extensions to further customize the user experience. 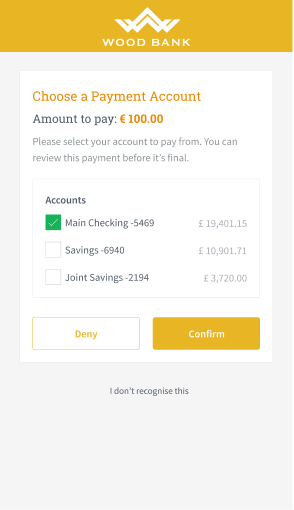 The first screen your user will see when they are redirected to TokenOS is a bank selection screen which prompts them to choose which bank to use. 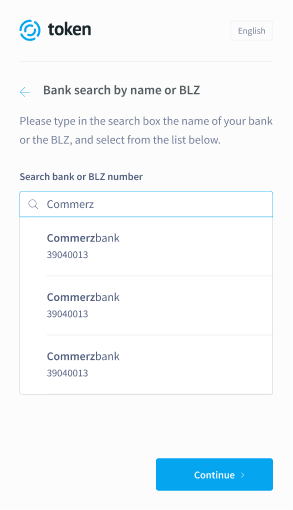 By specifying in your application the bankId of the user-selected bank when creating the token request, you can filter the banks available to the user or control the bank selection UI. To retrieve the list of banks to display, use the getBanks method. After obtaining the user-selected bankId, provide it in the TokenRequest. 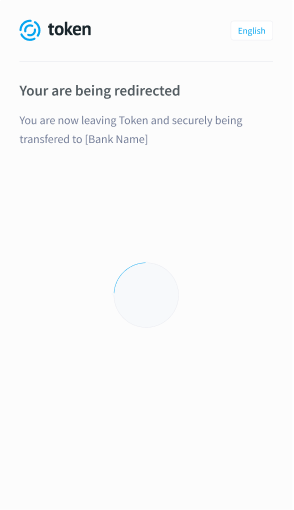 When TokenOS displays the TokenRequest, it will see that a bankId has been specified and default to that bank instead of displaying the bank selection screen. In the case of a Token integrated bank, your user may be prompted to provide their alias in order to enable a customer experience that does not involve entering bank credentials. To provide an even more seamless experience, you have the option of specifying the user’s email address when creating the TokenRequest. 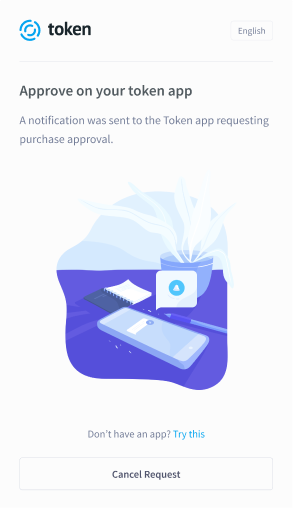 By providing the email, TokenOS will skip the email input screen entirely and ask the user to directly approve the request on their app. Upon receiving a token, you can check the terms of the token and inspect the Token object returned by retrieving it with the getToken method. You can retrieve an existing token by calling getToken on the token ID. This way, you can check on the status of the token by viewing the token’s signatures. For example, if the payer or grantor has canceled the token, then a CANCELLED signature will be present on the retrieved Token object. You can cancel the transfer token any time. 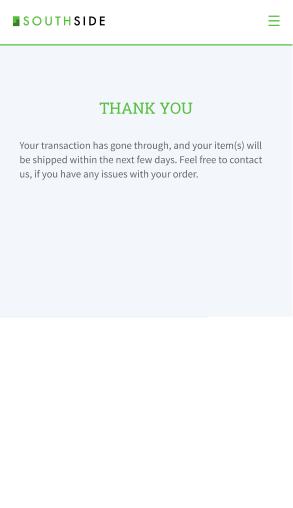 This will cancel any future payments the transfer token has authorized. IMPORTANT: Previous payments and pending payments CANNOT be reversed or canceled. Like transfer tokens, as an access token’s grantee, you can cancel an access token at any time. This prevents retrieving future information with the access token. // Retrieve an access token to cancel. The Member getTransferTokens method returns a paged list of transfer tokens for which the member was the payee. A paged list is a list of transfer tokens, starting with the most recently paid one and going back any number of tokens you wish to see. It also includes an offset that can be used to get any number of future transfer tokens. The Member GetAccessTokens method returns a paged list of access tokens for which the member was the grantee. A paged list is a list of access tokens, starting with the most recently granted one and going back any number of tokens you wish to see. It also includes an offset that can be used to get any number of future access tokens. This section describes runtime errors thrown by the Token SDKs, such as program exceptions. The Token Java SDK throws the standard gRPC exceptions; for more information, refer to grpc-java Status.java. You will see the enum names in stack dumps. The Token C# SDK throws System.AggregateException that wraps the standard gRPC exceptions; for more information, refer to grpc-csharp StatusCode.cs. To use the Token Java SDK you will need Java Development Kit (JDK) version 7 or later. You can find Javadocs for the Token Java SDK here and here. You can find the ESDocs for the Token JS SDK here and here. The SDK is based on C# 7.0. The target framework is .Net Framework 4.5.1. The package can be found on Nuget. For information about how to do this, contact Token. Many important data structures are defined as Protocol Buffer messages. The build process generates Java code from these. You can learn more about this Java Code. A quick start: If you have a Java object based on a protocol buffer definition, to get the value of the field named tool_name, there are methods named getToolName…; To create a Java object of a class based on a protocol buffer definition named Tool, call Tool.newBuilder().setToolName("Nice tool").build();. You can get the newest protocol buffer definitions by downloading the most recent jars. For protocol buffers, you want the “regular” jars, not javadoc or sources. You can also see them as web pages. The sample code below shows the protocol buffer for signature and how it is constructed in Java. Many important data structures are defined in terms of Protocol Buffer messages. For example, smart token signatures are defined in terms of the message Signature. You can also see the Token SDK protocol buffers as web pages. The build process generates C# code from these. You can learn more about this C# code. A quick start: If you have an object based on a protocol buffer definition, to get the value of a field named tool_name, get the property named ToolName. If that would give you a property whose name collides with the class that owns the property, e.g., Signature property inside a Signature class, get the property named Signature_ instead. The C# SDK fetches the newest protocol buffer definitions when it is built. You can get the newest protocol buffer definitions by downloading the most recent jars. For protocol buffers, you want the “regular” jars, not javadoc or sources. You can also see them as web pages. The sample code below shows the protocol buffer for signature and how it is constructed in C#. Depending on the underlying bank and its authentication and authorization method, the user experience may vary. The following screens are representative of most cases. 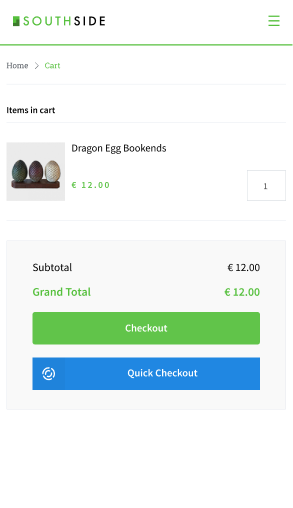 Example UX of a merchant requesting a bank direct payment using Token; the user is visiting the merchant website on a mobile device. Do I need to have an AISP (account information service provider) or PISP (payment initiation service provider) license to use your service? No, Token has obtained AISP and PISP approval by the FCA in the UK and passported across Europe. Please note than if you require AIS functionality you may be required to be registered as an agent of Token via the FCA. We will assist you with any required formalities please contact us for further information. Do you have a sandbox that I can test with? Yes, Token has a full sandbox with model banks for you to test your integration against. In the initial setup steps, point your SDK client to connect to our SANDBOX environment. 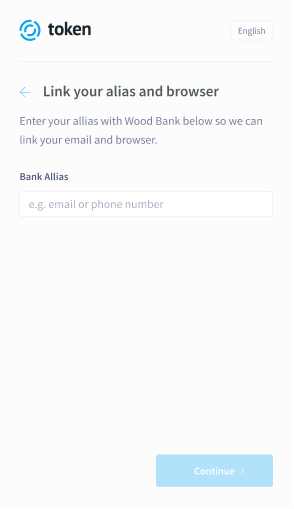 We recommend you start out with Wood Bank (United Kingdom), contact us to learn more about the other banks we have available. Can I test against sandboxes hosted by real banks in your network? When you have completed your integration and have successfully tested against Token’s model banks, you will be able to test with one of the directly integrated partner banks (pursuant to PSD2 regulations). For more details don’t hesitate to contact us. Can I set up a standing order or recurring payment using your Smart Token technology? While our technology is capable of this, the banks in our network currently only support single immediate payments. Standing orders, future dated payments, and additional payment options will be delivered during 2019. Does Token offer categorization options for retrieving transaction history? Token does not currently offer categorization; we expect to offer this service in the future. Can I make cross-border payments? The banks in our network currently only offer domestic payments; banks in select regions in our network are expected to support this later in 2019. As such, UK banks only support GBP payments, and EU banks only support EUR payments. Token uses underlying bank rails to initiate payments, the initiating bank determines the most suitable rail to use given the payment details. How do I notify Token of questions or issues I’m encountering? Contact Us at our support desk, and we’ll get back to you as soon as we can.